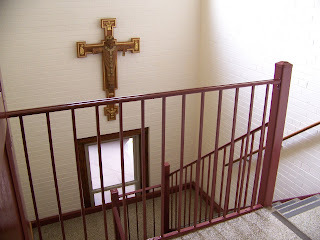 The Professed dorm stairwell. The corpus on this beautiful Crucifix is Christ the High Priest. This week our workmen have begun painting our stairs wells—the finale of painting the entire monastery which has gone on for about 3 winters. 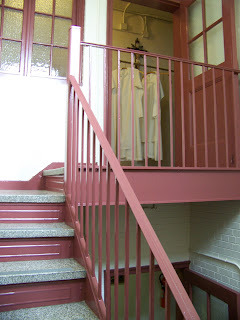 Much to our surprise, the prioress and maintenance nun picked out a new color for the fire doors and railings. No longer will they be "boring beige" (or as one sister calls it, 'puke beige') but "sweet rosy brown". "Sweet Rosy Brown" is a big improvement! The new color has brightened up our stairwells giving everything a fresh new look. The men are also enjoying a change from the different shades of white that have been staring at for the past months. Overheard conversations in the stair well are sometimes amusing! "It's hard to know where I left off," said Gary to Tom when they came back from break. "Yeah, I know what you mean," Tom responded. "I'd hate to give a second coat," replies Gary. Guys this has to last another 40 years! "Gary in the box"! 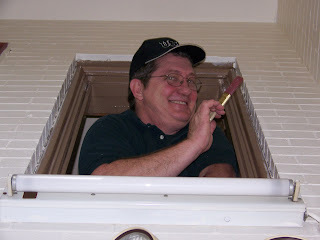 Gary leans out the window at the top of the novitiate stairs to begin painting the frame. He's always ready with a smile and a spiritual meditation! Next on the list are new lights in the hallways. This will be a BIG improvement! Our hallways are narrow and while we don't want bright institutional hallways but something that will foster the monastic ambiance, a little more light will be welcome indeed! An old monastery has a certain character and sense of history and this is especially so for our monastery. However, old monasteries also bring with them never-ending maintenance! Will the plumbing hold up or should we fix the back stairs first? But, ah! What you can do with a can of paint!